I'm excited that I finally have a finish. I'm not as fast as most quilters but that's because I have to put other priorities ahead of sewing, and I'm okay with that. I decided earlier this year that I'd like to make a quilt for each of my nieces and nephews. It's really not that many - only 4 total. I wanted to start with the oldest kids first and work my way down to the youngest, but trying to get a response from my 21 year old nephew about what he'd like is like pulling teeth. I decided to come back to him and find out what my 15 year old niece would like. She told me she'd like something to coordinate with her room, which was pink. Earlier this year I purchased a layer cake of Dear Stella's Flirt so I texted her photo of the prints and she said it was perfect. I decided to add a few other prints and Kona Graphite to round out the palate and made the pattern up as I went along. I used every last scrap. 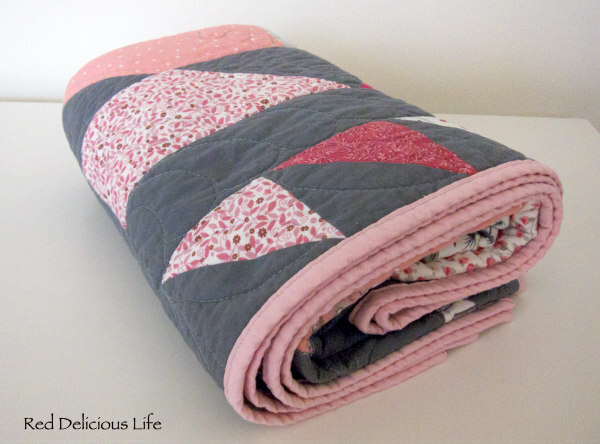 When it came to quilting, I didn't want to go too dense so that the quilt would have a nice drape and be super soft. So I opted for feathered tulips (not sure if that's what it is, but that's what I call it) in all of the gray triangles in the center, a row of pearls in the chevron pattern, half feathers in the gray border, and simple leaves in the outer border. I think it has the perfect amount of drape and was very pleased with how it turned out. I also love the overall look of the back of the quilt. I already told you about my quilt label mishap, but here it is, firmly affixed on the quilt... again. And this time to stay. Unfortunately, since the label with through the wash separately it got a little distorted shape-wise. Now all I have to do is figure out when to give it to her. She lives in the midwest and I'm in Florida. I'd love to give it to her in person, but I'm not sure when I'll see her next so I'm considering mailing it to her so she can use it this winter. It's not overly big, coming in at 48.5" x 57.5" -- just big enough to snuggle with while reading a book in a comfy chair. I hope she likes it as much as I enjoyed making it for her. 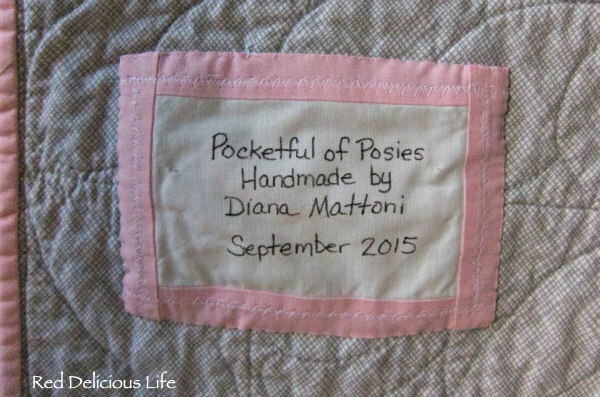 the quilting on this is perfect, Diana! It turned out so beautifully, Diana! I think it is a perfect snuggly size for reading in a chair and keeping warm on winter nights. I hope she loves it and can feel the love you put into it for her. a real beauty for a young lady. I want to make one for Sal who is 18 in april have mentioned it a few times but she is not being helpful, think she does not really want one but will ask once more. Maybe she thinks she will not get any money if \I make a quilt! will reasure her that is not the case!! What a pity you can not hand it in person. I would have wanted to see her face when see sees this beauty! Love your quilting and fabric choice. Hope you will soon know what your eldest nephew likes. Awesome quilt Diana~I love the colors, design & quilting!! Such a cute quilt! 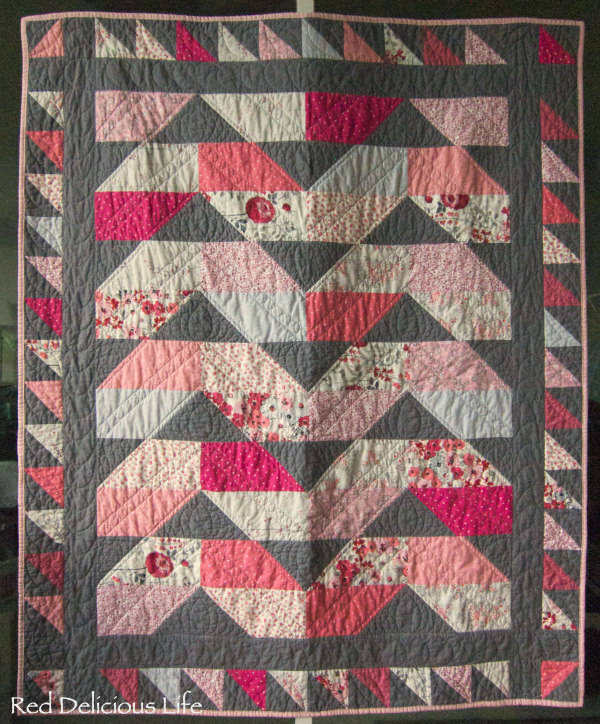 I really like the grey paired with the pinks, and the quilting design is stellar! Oh, she will love this! Perfect in every way. And very clever of you to use up every last piece of fabric - that's always a plus! I think for your older nephew you ought to just go ahead and make him something in his favorite colors. Or if you don't know his favorite colors, go with blue and green. Guys always seem to gravitate towards those colors. I'm making my son a quilt and got the same response from him: nothing. So, he gets what he gets! Thanks Jessica. 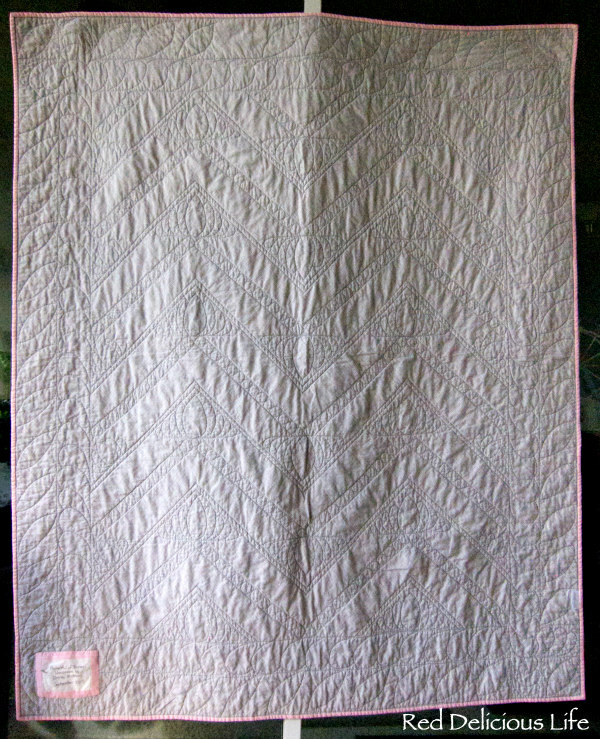 And no, definitely not my first quilt but my first largish quilt finish in 2015. My only other quilt this year was a bee quilt so I only made 2 blocks! I've done a lot more decor projects this year. What a lovely quilt - I really like the way you quilted it, very appropriate! That's a great colour combo. I love the soft pink binding. Of course she'll love it! And even more so because it came from Aunt Diana! That gray is beautiful with the pinks. I'm beginning to think that gray works with anything--I haven't see a gray I don't like! Oh, good luck getting info from a 20-something guy...they are too cool to discuss such things! Talk to his girlfriend instead but make it clear that it's HIS quilt. :-) Ask me how I know these things! The quilt for your niece is beautiful. I love the fabrics, design and your quilting. Hopefully you will be able to give it to her in person... it's hard to mail these masterpieces! Love the quilting on this one! She's going to LOVE it :). I think finding quilts for girls is so much easier than boys, good luck on 21 year old! I'm pretty slow too Diana. Maybe even slower than you! It's a lovely finish. I'm very impressed with your quilting. I'm sure your niece will love this quilt. I'm also wanting to give quilts to my niece and nephews. I was just planning on showing them a bunch of finishes and asking them to pick one ...but maybe I should ask for colour schemes like you did. Your quilt is so pretty and the quilting is perfect. I'm not a pink person, but I really, really like this. Well, maybe I'm turning into a pink person with your help.. I really like the color combination and you're right, the quilt looks totally comfy-cozy. Your niece is going to love this. I often think of doing a project like that for my nieces and nephews but the number is beyond comprehension and the great nieces and nephews number is huge already too! How sweet to be quilting for each of your nieces and nephews! Your niece is going to love this quilty hug and will think of you each time she snuggles up with it. Love the quilting. Just the right amount and such beautiful designs! You did a great job on doing this pattern as you went along. Your half square triangle border is just perfect to go with your chevron/geese section. Wonderful quilting too. She will love her quilt. Thank you so much. I really got lucky in how it came together. Free motion quilting is always my favorite part of making a quilt and I get better with each project. I am sure she will love it. 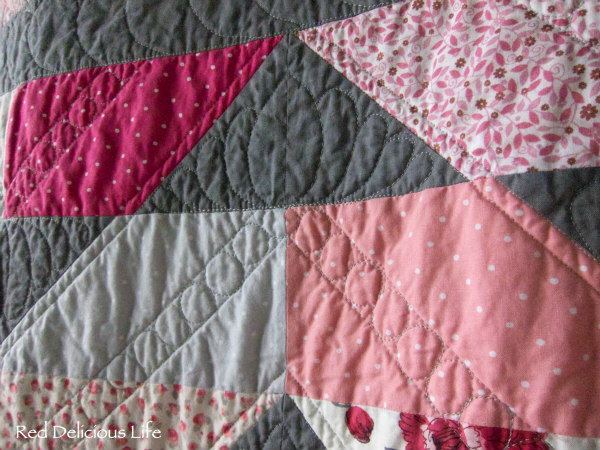 I know I do, especially the grey you chose to balance the pink and the attention to the quilting design. I am impressed by anyone who can FMQ well. I always come unstuck at the design point and end up with an all-over meander.